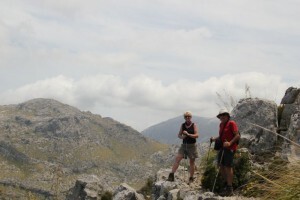 Puig Roig is the lowest and most northerly of the 1000m summits of Mallorca but also one of the most attractive. This was a B+ walk from the Paddy Dillion book with a recommended starting point at Mossa gate some 4 miles from Lluc. It recommends you walk in an anti clockwise direction but to be different we decided to start from Lluc in a clockwise direction. This way took us down hill into the valley first before becoming Â a classic circular walk around the mountain with excellent views round every corner. Amazingly the book says you can only do this walk on a Sunday as land owners will only allow you through on that day, we did come across signs saying walkers only allowed on Sundays !! The path around Puig Roig was on a narrow ledge at times giving great views of the coast, we met many other walkers but all going in the opposite direction to us, we did wonder if we would find out why at some point !! The hardest part was When Geoff had me climbing over a 6 ft gate to avoid some road walking. If coming to Lluc its definitely worth staying to do this walk as it has the WOW factor But remember to make sure your here on a Sunday, I am so glad we were !! It must have been the day for it, as I also got rather sunburnt around my neck on Sunday (Wales Coast Path in my case and without a cooling breeze – I just didn’t notice). At least I had remembered to put suncream everywhere else. GayleG? Who’s she? The text I’m typing isn’t showing on screen and it seems I got an extra G in there! Lucky you were there on Sunday. Is there anything stop you on the other days. Looked a bit of a narrow path.